Create responsive and filterable portfolios with ease on your website. Media Grid comes with masonry layout, is designed to adapt each portfolio to any situation and is mobile optimized for responsive themes. One on the most important things in a portfolio is to display clearly the items characteristics. They could simply refer to the author of a photo or display the track’s album or release date. With Media Grid you could create unlimited options for each item type, sort them and use only the ones needed. Create portfolio grids and their layout is simple and funny. Through the visual builder you have only to create new grids, choose the items to use and sort them. Each item will be displayed in the live preview with its proportions letting you see the final result. Once you’ve created you’re grids, you can use them in your website simply using the Media Grid shortcode wizard on top of each page or post editor. Choose the grid, if display the filter bar and if use the default resizing system or set a fixed width for the items. The strong point of Media Grid is the customization. You can adapt the grid look and feel as you want to fit with your website design. Create unique grids using the sizing system: you can choose between a wide variety of sizes to apply to your items. They will be always calculated on the container width, so the aspect ratio of each grid item will be always the same! You can customize almost everything in the grid design: colors, patterns, margins, border and shadows. Try out a demonstration of the customization possibilities in the live preview. Finally in the settings you can freely customize everything using your custom CSS. You never have to lose time searching the grid elements, they are all listed in the detailed legend. 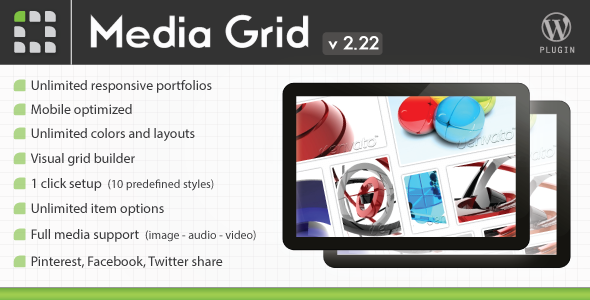 Share the post "Media Grid – WordPress Responsive Portfolio"